I attended another BMWCCA driving school, this time mid-week at Laguna Seca. The A/B group (I got promoted back to the A group, yeah!) was uncrowded and I had many traffic free laps. Just prior to this event I switched to more narrow tires. From 255s front and 275s rear, to 235 s front and 255s rear. The numbers are the approximate width of the tire in millimeters. That translates to about an 0.8 inches of rubber per corner. I did this because the larger tires were rubbing against the wheel wells and suspension under heavy cornering. While I was quite happy with the setup, the overall stress of monitoring the wheels during events was annoying. The smaller tires had me running almost 4 seconds slower at Laguna Seca yesterday. Some of that time is was the fact that the tires were not shaved and brand-sticker-new. Turn in was a bit squirmy and slow to take a set. I had to completely rewire my turn-in style. With the fatter, mature RA1s I could do a very aggressive turn in and then gas it through/out of the corner. The new, skinnier RA1s needed a more gradual turn in to take a set, and a more gradual addition of throttle. As a result of the smaller tires, I found the car responded best to slowly dialing in steering and throttle on the way to the apex, then unwinding the steering slowly on exit. Adding throttle and steering at the same time violates the general rule of never adding throttle (or braking) at the same time as steering input. And if I got the mix wrong the car would understeer, but if I got it right the extra throttle kept the car balanced and turning. The smaller tires are definitely forcing me to be a better driver. The fatter tires were masking some bad habits, so yesterday was full of learning better and smoother steering. 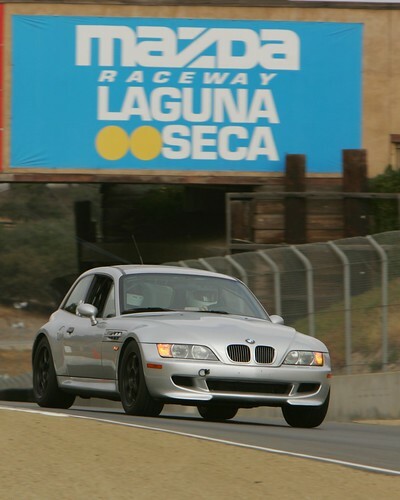 M Coupe @ Laguna Seca from B Dole on Vimeo.